This Honda XBR500 was originally started as a request from a customer that asked us to build his bike. Lastly, that it had to be done in 2 months – completed with MOT! Given that they were our only stipulations, we could literally do whatever we liked with this little beauty. Before it came to us, someone had already attempted to make it a Cafe Racer style bike and had failed miserably. It looked more like a Street Fighter than a Cafe Racer! The original Handlebars were put underneath the Top Yoke, a custom Stainless Exhaust had been built for it, the Fuel Tank had been lost and it had been put away in a garage and stored for a good few years! It came to us looking like this…. The first thing we did was get the Honda XBR500 running. We put fresh fuel in the Small Tank that we use when building any bike, connected a charged Battery, pulled the Choke on and pressed the Start Button with not much hope. To our surprise, it proved us wrong! First time of trying and it turned over, fired up and was ticking over smoothly till warm then ran perfectly off the choke. We prayed that the rest of the build was going to be this easy!! We then had a play around with the style we wanted the bike. After rifling through many different seats and tanks that we make/sell, we had a rough idea of how we wanted the Honda XBR500 to look. At this stage, we had the style of the bike sorted and the build was on!! A few hours later, the Honda XBR500 was just a pile of bits. After some thinking, we decided on the colour of the bike. The Tank, Seat and Mudguard all Black/Grey (Carbon Fibre) with the Frame and the Decals down the centre of the Mudguard, Tank and Seat in Candy Fools Gold. The build was now in full swing!! As the Honda XBR500 was completely stripped down, we cut off all the unwanted Brackets, the Main Stand and the Subframe. We then welded some small gussets in the triangulated part where the Side Panels went and a bar where the Subframe was cut back (to mount the Light and Number Plate Bracket) before sending the Frame and Swinging Arm off to the Sand Blasters. Over the couple of days that the Frame was away, we cleaned and de-greased the engine giving the Rocker Cover a quick polish with the Wire Brush on the Drill. The Covers were then sent off to the Polisher and all the little Brackets were painted. The Frame and Swinging Arm came back from the Blasters and we spent a while filling and smoothing the welds that were seen. I also stumbled across some really cheap RS250 Spokies on eBay so they was ordered and got the front fitted in the XBR Forks. We got the Frame Acid Etched Primed and High Build Primed, but we wasn’t happy with a few imperfections in the finish so it was a bit more filling and flatting before the base coat could go on! Then we found an old CB900F Disc laying around our Unit so we gave it a try.. it fitted and lined up perfectly! We finished the flatting, filling and re-priming the Frame whilst waiting for a few things to be delivered such as, Stainless Bolts, K N Style Air Filter and the Exhaust. Then we got the Frame, Swinging Arm, Side Stand and Torque Arm in the Bright Base Coat Silver. The rest of the Engine that wasn’t at the Polishers, including the Crank Cases were painted in Gloss Black Engine Enamel. All the Bolts/Nut were replaced with Stainless Allen Bolts. Once the Frame had dried completely, we got the Frame and the Swinging Arm painted in the Candy Fool Gold Colour and lacquered with many coats of Clear Top Coat. “I cannot afford to do this bike anymore (we had no where near exceeded his original budget), I’ve lost my job, my Girlfriend’s pregnant, my Car failed the MOT, someone drown my Goldfish and the Hamster died.” Although we did feel for him, we did explain how he couldn’t take the bike until he had paid for the Parts and Labour done so far. At this point, we thought we was in the middle of a really good project that was never to be finished. Being the kind Yorkshire Man I am, I offered the customer a small amount of cash and to let him off with what he owed us and much to our delight, he was back 15 minutes later with the Log Book – RESULT! This took the pressure off a bit, but also raised the standards. We were no longer working to a budget, we no longer needed anybody else’s approval for anything, it was ours and we could what we wanted with it. So off we went to see the guy that does our Chroming with loads of bits to get this done properly! Once that was sorted we then painted the Bottom Yoke, Torque Arm and Side Stand in Base Coat, Colour and Lacquer. Everything was started to go well again! We decided to spend a couple of hours getting the engine built up, putting the Polished Cases on and changing every Bolt for a Stainless Allen Bolt. Just as I was tightening the Genny Cover down, it all went pear shaped.. MASSIVELY!! I used an Allen Bolt and Washer on the Genny Wire Retaining Clip Bolt, which must have been touching the Crank Case. I wouldn’t mind but i was hardly tightening it, never mind swinging on it like a bloody monkey!!! The crack ran down most of the inside of the case so instead of having it welded, we just got a new Case for it. Once it had arrived, it was sent straight off to the Polisher. In the mean time, we looked over the Seat Unit that we had made for this build and decided it looked too wide at the back and a bit bulky too. So it was time to make a new Seat Plug especially for this bike. Our “Seat Man”, who makes all of our Seats did an amazing job on this as we could only allow him a days time to do it because he was needed to make all our other seats which were selling rapidly! Whilst he was doing that, I got on and prepped the tank for painting ready to make the moulds. After a bit of Black 2K Paint, this is what we ended up with. We also got the Candy Fools Gold onto the Frame too – it was starting to look gorgeous! Next challenge… making the Carbon Bodywork! We were now on a hunt to try and find somebody to make us an offset Sprocket as it needed to be RS250 Mount 34t and roughly 8mm off the offset. In the meantime, the new Engine Casing came back from the Polishers and went straight onto the Honda XBR500. After originally designing this bike with Carbon Tank, Seat and Mudguard, we decided to make the Chain Guard, Headlight Bowl and Fuse Box Cover Carbon aswell! This week became a disaster! We were now in the middle of August – Holiday Season! And for some reason, EVERYBODY that we needed that week, decided to be spiteful and go on Holiday!! The original 2 Month deadline was only a week away, and even though the bike was now ours and no longer the customers, I still wanted to get the bike done. The Polisher still had some little bits but more importantly, he had the rims! He went away so we couldn’t get them. The guy that builds my Wheels went away so we was stuck without the Wheels for another week. The Chromer went away for the week and he still had a few bits from the Honda XBR500 that we needed. It seemed like everybody was doing everything and anything to make this more difficult. As we was without everything we needed, we decided to get on with what we could. We started by putting the RS Rear Hub in the parts washer to get off all the solid grease. All was going well until a great chunk of Metal fell out around one of the Bearing Mounts. Then we noticed that one of the Cush Rubber Mounts had been glued back on. Into the Scrap Ally pile..
We couldn’t find another RS Rear Hub or Wheel anywhere so we ended up buying a CB350f CB400f Wheel from the early 80’s – another £60.00 down! The Front Disc I had was warped so I had to buy new ones and have them delivered – more money! However, it wasn’t all bad. Some things went well..
We were getting there slowly. Just needed a new charger for the camera! As everyone was on holiday and we couldn’t get our parts, there wasn’t much more we could do for a while. But we soon got back to it and decided to tackle the wiring – oh dear! It was a right mess, with lots of twisted wires in insulating tape. The indicator wires and relays were removed and relocated all the components under the Seat Hump. After many many hours, we got it all soldered with heat shrink over the joints and just about sorted it. The Body Work was coming along nicely too. 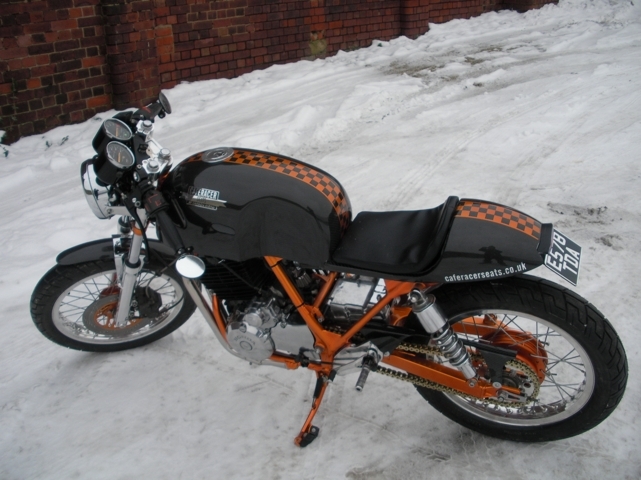 The Tank Cover was made, and the Seat, both Front and Rear Mudguards and the Chain Guard all just needed Lacquering. On to making the Wheel Spacers and collecting the Spoked Front Wheel and the Front Mudguard Brace from the Chromer. The Front end was finally coming together. We finally built it up as a fully rolling bike. All the Spacers were correctly sized, both Mudguards and the Chain Guard had been lacquered and the Inner Tank was fabricated. We could not work out what to do with the Exhaust as although it was a Purpose Made Stainless System, it was grotty. We got a quote from a so-called ‘friend’ (he’s a great friend when he wants Carbon bits making but when I want an Exhaust making, it’s a different story!) for the Downpipes and he said £200!! Instead, we decided to let one of our lads have a go at cleaning and polishing them up with a back up plan of, if all else fails, they can go Matte Black. As you can see below, after just a hour, he did a cracking job! Things went on hold for a while as we attended a Bike Show in Germany. Once back, Both Mudguards were lacquered and fitted, the Stainless Collector Box were fabricated, polished and fitted with our Complete Cafe Racer Megaphone Exhaust. We had some new Braided Oil Pipes made up to the Tank and Fitted them along with new O Rings. Then we started cutting the Backing Plates out for the Rearsets – Still need to do the Wiring! We FINALLY (8 hours in total) got those Electrics sorted!! After we removed all the Wiring that was not needed such as the Indicators, Rear and Brake Light Warning System, Side Stand Switch, Clutch Switch etc. The dodgy taped and crimped Honda joints were also removed and replaced them with proper soldered joints covered in Heat Shrink. We extended the CDI, Starter Solenoid and Rectifier wires so they fit in the Seat Hump. The Rectifier sits under the Carbon Undertray to keep it nice and cool, everything worked as it should, turned over on the button and even got a spark! We did have a slight panic moment when we couldn’t get the Clock Lights. We ran a Positive and Negative straight to wires and still got nothing. So we put a test Light across the feeds and got light. We realised it was nothing we had done wrong, we just had four blown bulbs in both of the Clocks. We got the new Gold O Ring, Chain and Carbon Chain Guard fitted then made the Carbon Number Plate and Rear Light Bracket. Unfortunately, the Rear Light got dropped on the floor and started to do some really strange things. There was three bulbs constantly on, only half of the bulbs came on for the Brake Light, some LEDs were brighter than others, it was time to order a new one! So along with a new battery, we ordered the Rear Light. Next up was fitting the Choke and Throttle Cables and then fire her up for the first time since the rebuild! The only jobs left to do were lacquer the Tank and Seat, do the chequers down the center of both the Tank and Seat in the same Gold as the Frame, make the Mounting Brackets to fasten the Seat Unit to the Undertray which is secured to the Frame, make and fir the starter to the Battery / Solenoid Lead, wire the New Rear Light in and fit the Number Plate then it was done! Both side Rearsets were roughly cut out of Plate Ally and fitted with the Carbon Heel Guards, and we got the first coat of lacquer on the Tank and Seat Unit. It just needed flatting back, the artwork doing in the Silver Base Coat, then again in the Candy Fools Gold and then lots more lacquer over the top! We really wanted this Honda XBR500 finished. We was now well over the original 2 month deadline, which didn’t matter as the bike was now ours, but we was too excited and wanted to see it finished. So, no rest for the wicked.. On with the painting! We flatted the bodywork back with 240 Grit on the DA and lacquered the Carbon to fill in any imperfections in the resin (which always occur in the form of tiny pin holes). We then got all the Bodywork masked up and ready for painting! First we applied the Silver Base Coat, then the Base Coat, then the Candy Fools Gold. It was then an anxious wait till the next day to see how it had turned out! After a quick flat with 800 Wet and Dry, a good wipe with Panel Tape, and a rub over with the Tank Cloth, it was time for more coats of 2 pack lacquer. The Honda XBR500 is FINISHED!! We are super happy with the result except for the look of the Rearsets – We hated the look of those! They now have been modified with our new Milling Machine, painted in the Fools Gold colour and Polished. Had it running, it started up with the second press of the Start Button. But WOW is it loud.. TOO LOUD! This bike will definitely have to be baffled before we have a workforce with no hearing left. It did start to leak a oil but nothing a nip around the Allen Bolts for the Clutch Case didn’t sort! It is ready for the upcoming Shows! Follow the link below to see it in action!